Christopher J. Danner M.D., FACS is an Otologist, Neurotologist, and Skull Based Surgeon in Tampa, FL. 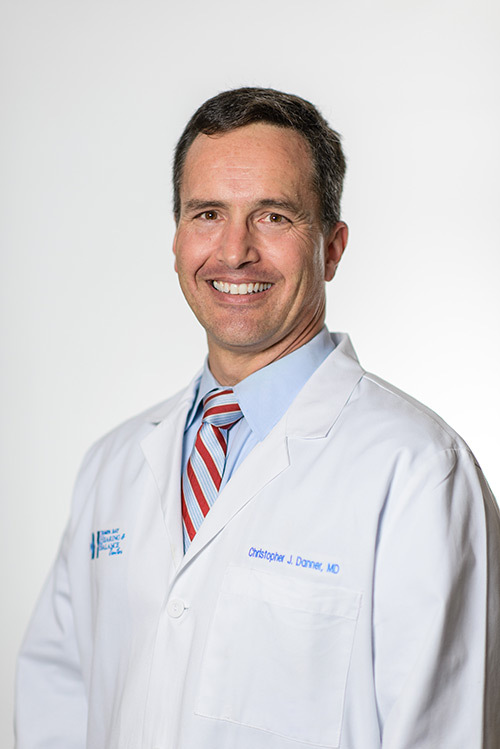 Christopher J Danner MD FACS began his medical career in 1996 when he received his medical degree from the University of Alabama at Birmingham with Honors. After graduating in the top 5% of his class, he completed his postgraduate residency training in otolaryngology (head and neck) surgery at the University of Arkansas for Medical Sciences (UAMS) – his first choice in residency programs. While serving as chief resident, Dr. Danner was invited to join the faculty at the University of Arkansas for Medical Sciences. Dr. Danner completed a two-year subspecialty fellowship in otology, neurotology, and skull base surgery at the University of California San Diego, after which he returned to UAMS as an assistant professor serving as faculty in the College of Medicine. During his time as both a resident and faculty member at UAMS, Dr. Danner was awarded a Distinguished Faculty Award, Faculty Teaching Awards, A Certificate of Appreciation in recognition of his efforts to provide the highest quality of care, and numerous research awards. Dr. Danner continues to bring new information to the medical community through his leadership and involvement in ongoing research projects. Articles detailing his findings have appeared in such notable publications The International Tinnitus Journal, ENT Journal, Otology and Neurotology, and the American Journal of Otolaryngology, among others, and he has been invited to present numerous national and international presentations regarding his research and the clinical management of different ear diseases. Dr. Danner has been recognized in Best Doctors in America in 2007 and is a member of several prestigious professional societies including: The Prosper Ménière Society, The American Academy of Otolaryngology Head and Neck Surgery, The Arkansas State Medical Society, Alpha Omega Alpha, American Neurotologic Society, and American Medical Association. 2008 Guest Faculty Instructor, Temporal Bone Dissection Course, Emory University, Atlanta, Georgia. 2007 Clinical Preceptor, Skills Assessment Session, Physical Diagnosis II, “Head and Neck Exam” University of South Florida School of Medicine, Tampa, Florida. The purpose of this research is to track the acquisition of listening and functional communicative skills in young deaf children who receive a cochlear implant in each ear at the same time (or separated by no more than six months). This information will help determine the benefits of receiving bilateral implants at an early age. The purpose of this clinical study is being conducted to look at the bilateral benefits of two Bionic Ears (one implant in each ear) and to look at the effect of the different sound-processing modes on bilateral benefit. The goal of this study is to develop a simple reproducible test that can effectively quantitate otolith function. Our overall goal is to develop and implement a comprehensive assessment of all levels of the neuraxis in an effort to determine CNS deficits due to a provoked (e.g. rotation)or existing condition (e.g. balance disorder, tinnitus), and develop and assess strategies to restore those deficits. Source of Funds: Internal Institutional Funding, National Institute on Deafness and Other Communication Disorders (NIDCD) grant applied for but not awarded. The objective was to evaluate the effectiveness of the transfected gene for IP-10 in modulating the vascularity and growth of tumors. The objective of this project was to study the relationship of Atrial Natriuretic Peptide (ANP) with fluid homeostasis in the inner ear. ANP binding sites were identified and up regulated. Cueva R, Danner C, “Prevention and Management of Cerebrospinal Fluid Leaks”. In: Surgery of the Ear Sixth Edition, Julianna Gulya, Lloyd Minor, Dennis Poe (eds.). People’s Medical Publishing House, Shelton, Connecticut. 2010: 765 – 770. Danner CJ, Dornhoffer JL, Linskey ME, “Cranial Nerve VII Reconstruction”. In: Atlas of Neurosurgical Techniques, Lalingam Sekar (ed. ).Thieme, New York. 2007:882-884. Danner C, Harris J, Hearing Loss and the Aging Ear. Geriatrics and Aging, 2003; 6(5):40-43. Dornhoffer JL, Danner C, Zhou L, Li S, Atrial Natriuretic Peptide Receptor Up-regulation in the Rat Inner Ear. Annals of Otology, Rhinology & Laryngology 2002; 111:1040-1044. Dornhoffer JL, Danner CJ, Li S, Natriuretic Peptide Receptors in the Human Endolymphatic Sac. Archives of Otolaryngology – Head & Neck Surgery 2002; 128(4):379-383. Lim V, Danner CJ, Colvin GB, Karpe L, Schaefer R, Dilday B, Farris P, Primary Basal Cell Carcinoma of the Middle Ear Presenting as Recurrent Cholesteatoma. American Journal of Otology 1999; 20:657-659. Danner CJ, Dornhoffer J, Primary Intubation of Cartilage Tympanoplasties, How I Do It. Laryngoscope 2001; 111(1):177-180. Danner CJ, Bodenner D, Breau R, Lingual Thyroid: I131, A Viable Treatment Modality Revisited. American Journal of Otolaryngology 2001; 22(4):276-281. January 26, 2007 Cochlear Implants, CME lecture for operating room nursing staff, Tampa General Hospital, Tampa, Florida.